Indestructible is a landmark of sorts for James Christian and his band House Of Lords. It's their tenth studio album in a career that dates to 1987. It's also been ten years with the same line up: James Christian, Jimi Bell on drums, Chris McCarvill on bass, and BJ Zampa on drums. Band stability is always a positve thing. Another thing that hasn't changed is the House Of Lords approach to music. 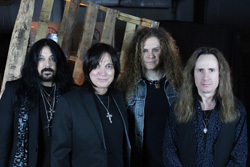 The last several albums find the band delivering classic melodic hard rock with a strong metal edge. Of course, all this is wrapped up big melodies, arrangement and lyrical hooks, fiery guitar solos, and lush production. Some of the heavier and hard charging songs come at the start with Go To Hell and Indestructible, but also later with Die To Tell. That song has this guitar synth mixture with chanting vocals over steady drums at the start, only to erupt into some blistering melodic metal. The following Another Dream has another interesting preface from guitars which leads into catchy melodic rock anthem, moved mostly by the groove and Christian's vocal arrangement. The anthem and ballad themes continue with Call My Bluff and We Will Always Be One. The former is another song that revovles around a catchy AOR melody and vocal arrangement. It's likely the lightest number here. The latter song is probably closer to a true ballad, but feels more reserved, even slow. It wasn't one of favorites, but it won't sink an otherwise fine album. The album rounds out with more of the Lords metal-ized hard rock. Ain't Suicidal features some sharp guitars and a brisk pace. Stand And Deliver also races with song largely moved by riffs and rhythm section powering the pace. This song, along with a few others, also pointed to something of a problem. At times it seemed like Christian's vocals were overrun by the music, suppressed in the mix. Otherwise, as with previous albums, Indestructible finds House Of Lords true to form, delivering heavier, guitar driven, melodic hard rock. Recommended. 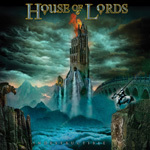 As with previous albums, Indestructible finds House Of Lords true to form, delivering heavier, guitar driven, melodic hard rock. Recommended.